Congratulations to our 2018 Research and Engineering Apprenticeship Program (REAP) interns for completing their summer projects with HEMI! 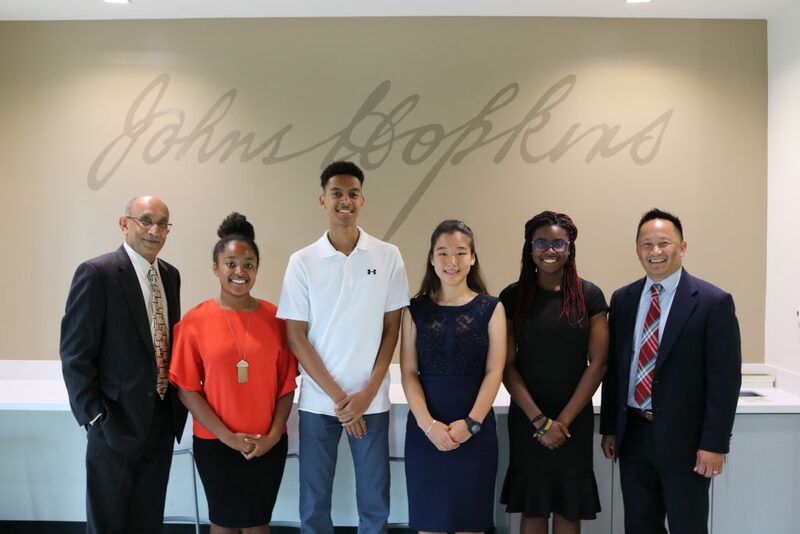 Interns Taylor Beverly (Eleanor Roosevelt HS), Chimmuanya Iheanyi-Igwe (Howard HS), Grace Kim (Poolesville HS), and Brook Mesfin (Walter Johnson HS) each completed a project under the mentorship of a graduate student/postdoctoral fellow in one of the following JHU departments: Civil Engineering, Mechanical Engineering, and Physics & Astronomy. 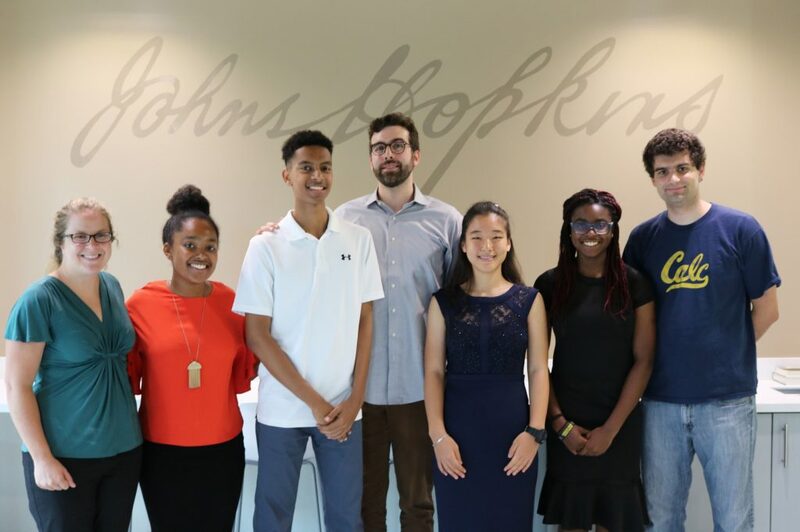 Earlier this month, the interns presented a summary of their projects to an audience containing members of HEMI, members of the U.S. Army Educational Outreach Program, their mentors, and their friends and family. From left: KT Ramesh (HEMI), Taylor Beverly (REAP Intern), Brook Mesfin (REAP Intern), Grace Kim (REAP Intern), Chimmuanya Iheanyi-Igwe (REAP Intern), and Louie Lopez (AEOP). From left: Kimberly Andes (Dept. of Mechanical Engineering), Taylor Beverly (REAP Intern), Brook Mesfin (REAP Intern), Thomas O’Connor (Dept. of Physics and Astronomy), Grace Kim (REAP Intern), Chimmuanya Iheanyi-Igwe (REAP Intern), Noah Wade (Dept. of Civil Engineering). Not pictured: Joel Clemmer (Dept. of Physics and Astronomy), Aakash Bangalore Satish (Dept. of Civil Engineering). REAP is an Army Educational Outreach Program that places talented high school students in research internships area colleges and universities. In REAP, a summer STEM program, students work on a hands-on research project under the direct supervision of a mentor, exposing them to the real world of research and allowing them to gain valuable mentorship and learn about education and career opportunities in STEM. Each year, over 120 students participate in REAP nationwide at 42 participating universities. Approximately 90% of the REAP interns pursue STEM studies at the post-secondary level.